The Sun Compass was used as a navigation aid by the American Army in the North African desert during the Second World War. It is basically an analemmatic sundial. but, whereas we normally know the location and orientation of a sundial and we use it to determine the time, in this case, we know the location and the time and we use it to determine a direction we want to follow. According to the Manual, 'the Universal Sun Compass is a mechanical device which utilizes the azimuth of the sun to obtain true direction .' It was intended to be used on vehicles such as lorries and tanks and 'has many definite advantages over the magnetic compass' . In particular, it 'is not affected by any local magnetic attraction such as electrical circuits or metal as is the case with the magnetic compass. However, the Manual does concede ' The sun compass can only be used when the sun is shining, so it is the complement of, and does not replace the magnetic compass." Different parts of Sun Compass. The sun compass looks very like an 'analemmatic' sundial and indeed it makes use of the same principles. For an given latitude and time (date and local apparent time), the direction of the sun, its 'azimuth', is known. In an analemmatic sundial, which is located in a fixed position and accurately oriented, the shadow cast by the vertical gnomon on the dial plate is used to determine the sun's azimuth and, for the current date, the local apparent time. With the sun compass, the dial plate is not fixed in position but can be rotated around the gnomon. The user needs to orient the sun compass accurately so that he can set a course from a map over featureless terrain. 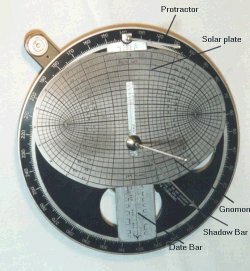 Since he knows his location, in terms of latitude and longitude, and also the local appparent time, if he rotates the dial plate until the shadow of the gnomon falls in the direction indicated for the current date and latitude, then the sun compass is correctly oriented and the required bearing can be determined. The compass is mounted on the outside of the vehicle in full sunlight. It is provided with a gimbal mounting and a built-in spirit level . The circumference of the protractor is marked off, anti-clockwise, in 360 degree graduations and is fixed so that the 0 -180 degree line is parallel to the centre line of the vehicle. The gnomon is a six inch vertical rod which screws into the top of a pivot bolt in the centre of the protractor. The remaining functional parts, the date bar, the solar plate and the shadow bar can all rotate around the pivot bolt, which can be slackened off to allow rotation and then tightened again after the instrument has been set up. The date bar has a centre line terminating in an arrow head, which is used to point to the required bearing on the protractor. Along the length of the date bar there are a series of marks against which dates within the year are engraved. These are used to position the solar plate, which, in addition to rotating around the pivot bolt, can also slide along the date bar. 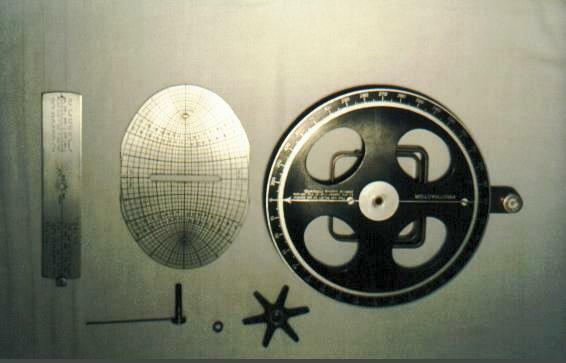 The solar plate is the key element in the operation of the sun compass. 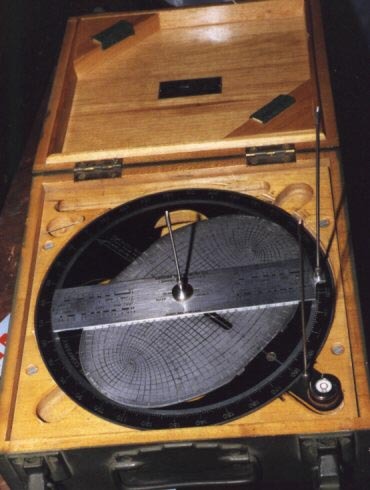 Elliptical in shape, it is engraved with a series of concentric ellipses, each marked for a specific latitude, between 45 degrees north and 45 degrees south,.and a series of intersecting time lines, indicating local apparent time (sun time.) from 6 a.m to 6 p.m. The shadow bar also rotates around the pivot bolt and is used in conjunction with the solar plate to indicate where the shadow of the gnomon should fall for the current time and latitude. HOW TO USE THE SUN COMPASS. Now rotate the date bar until the arrowhead points to the required bearing on the sun compass protractor. Rotate the solar plate until the flat outside edge is aligned with the date bar and now slide the solar plate along the date bar until the flat outside edge coincides with the line on the date bar for today's date. The next step is to determine Local Apparent Time. This involves making the necessary adjustments to Clock Time to allow for longitude difference from the Clock Time Meridian , the Equation of Time and, if necessary, Daylight Savings. Rotate the shadow bar until it coincides with the intersection on the solar plate of the lines for your latitude and the local apparent time. The sun compass is now correctly set and to prevent unwanted movement, a nut on the pivot bolt is tightened to lock date bar and solar plate in position relative to the protractor and each other. When the sun compass has been correctly set up as described above, in order to proceed on the required bearing, the vehicle driver has to steer the vehicle so that the shadow of the gnomon always coincides with the shadow bar. As long as the vehicle is on course, the arrowhead on the date bar is pointing true north. The manual recommends that ' the shadow bar should be reset to a new local apparent time at regular intervals of 15 minutes. On long East-West journeys, the manual comments that the user may have to take into account the change in longitude in calculating Local Apparent Time. 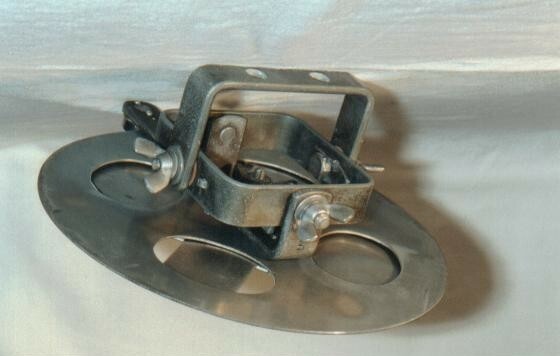 The Sun Compass was manufactured by the Abrams Instrument company in Lansing, Michigan, USA. The company is still in operation today but it has not made this instrument for a long time. Abrams Instrument specialised in instruments for the aviation industry and made the Sun Compass under contract for the American government during the Second World War. (The manual in our possession is dated 1943). The Sun Compass seems to have been used mainly in the North African desert by the American Army. B24 Liberator bombers were equipped with this instrument so that, in case of a crash, the survivors could orientate themselves in the desert.